The addition of a conservatory is a cost effective solution to extending your home without incurring moving costs. Investing in a conservatory is a great way to expand often limited living space. With modern living it can bring the tranquility of your garden into your home, making a seamless transition from indoors to out. Adding a light, modern space. Growing trends for larger kitchen and dining areas have seen a rise in recent years and has predominately been a reason for investing in a conservatory. Conservatories can be used for a variety of purposes from a larger kitchen with a dining area to an informal living area. The three facet style classical Victorian Conservatory is a simple but elegant design. The Victorian conservatory style is based on what was originally created during Victorian times, as a warmth area with plentiful sunlight. Conservatory architecture varies from typical Victorian glasshouses to modern styles such as geodesic domes. A Victorian style conservatory has a multi-faceted front which provides a regal curve which will add cultivated beauty and grandeur to any home. Our range of conservatories come in 3 and 5 facets. There are three popular materials to choose from: PVCU, Hardwood and Aluminium. 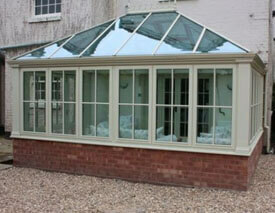 The Victorian conservatory design will suit modern to traditional properties. Every conservatory is custom built and made to measure, it can be tailored exactly the way that you would like it. Adding extras such as Pilkington “K” glass (Low E glass) and “Anti Sun” glass enable you to truly have an all year round room adding both value and pleasing aesthetics to your home. Our dedicated designer will ensure that your conservatory coexists perfectly with your home. Our priority is customer satisfaction, so our designer will spend time explaining each step of the process from basic design to the final build and will be on hand throughout the process. For details on how we can help you choose the best designs for your home please contact us. We are a specialist glazing company and will manage all aspects of the project, including dealing with any planning or building regulations. According to recent research, building regulations and planning permissions are confusing to buyers when considering a conservatory. Planning permission covers the visual impact and size of the structure, not the technical integrity. Building regulations cover all aspects of construction. Planning permission is not usually required for conservatories. Conservatories offer a fascinating history, originally used in Europe to preserve citrus and other tender plants for the cold season. Have you heard of the expression “Orangery” this is where the name was given.